‘Our own boys used to go shooting people after school’. Clara Rudnick around age 15. I’m sharing a pair of articles that I think are illuminating on the state of affairs regarding the Holocaust in Lithuania. 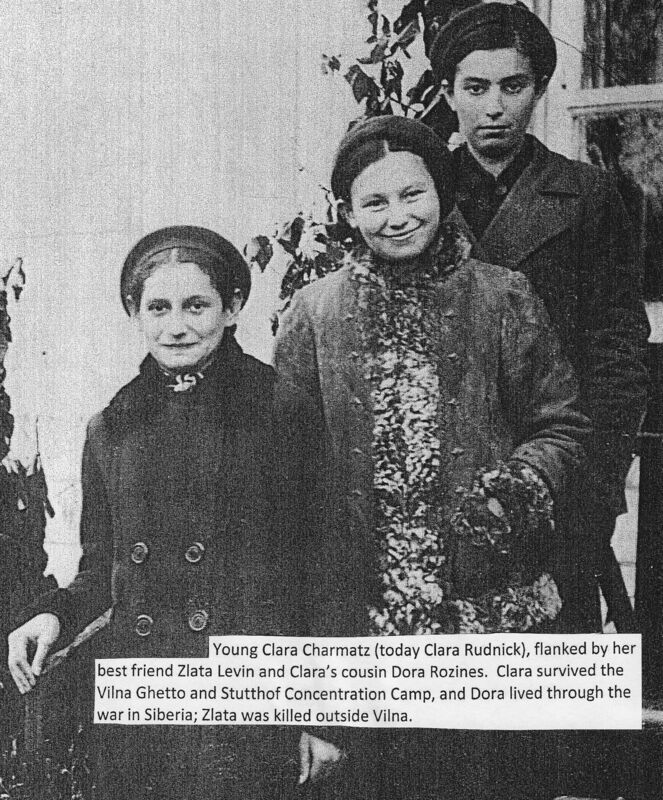 In previous posts I have told the story of my friend Clara Rudnick who somehow was able to survive where most all of her friends and family in Lithuania were murdered. She also bravely went back for a visit in 2013 with her son, and found that people did not know, or pretended not to know, what happened only a couple generations back. As the author of a best-seller that deals with female sexuality after 50, the Lithuanian novelist Ruta Vanagaite is used to embarrassing questions from journalists about her private life. But even she was astonished when a reporter for a popular television station demanded to see her birth certificate to ascertain the veracity of claims that she is Jewish. The question came during an interview about Vanagaite’s latest book, “Musiskiai” (“Our People”), a travelogue about the Holocaust consisting of interviews with witnesses to the atrocities perpetrated by Lithuanians against their Jewish neighbors. The book’s publication last month has triggered the first major public debate in Lithuania about local Lithuanians’ complicity in the genocide of the Jews. It currently tops the best-seller list of the Pegasas chain of bookstores and has prompted officials to promise to publish this year the names of 1,000 Holocaust perpetrators they have been keeping under wraps for years. Vanagaite, who is 61 and not Jewish, visited killing fields in Lithuania and Belarus to research the book, which she co-authored with Efraim Zuroff, the renowned Nazi hunter and director of the Simon Wiesenthal Center’s Israel office. Though she found the journalist’s request to see her birth certificate unsettling, she complied anyway. But that is beginning to change thanks to Vanagaite’s book. The 304-page volume has prompted not just the official Jewish Community of Lithuania but also local media outlets to demand the government publish its list of suspected war criminals. The government received the names in 2012 from its own Genocide and Resistance Research Center but failed to publish them or issue any indictments. The center’s director now has promised to publish the names by 2017. Vanagaite’s book also has highlighted the fact that despite ample evidence and testimonies of widespread complicity, not a single person has been imprisoned in Lithuania for killing Jews during the Holocaust. Vanagaite experienced this reluctance personally last year when she made an unwelcome discovery that served as her motivation to write the book in the first place. In researching the life story of her grandfather — a well-known activist against communist Russia’s occupation of Lithuania until 1991 — she found documents that showed he helped German authorities compile a list of 10 Jewish communists during World War II. The German authorities then gave him some Jews to work on his farm as slave laborers before they were murdered. In Lithuania, locals who fought with the Germans against the Red Army are widely revered as patriotic freedom fighters — including Juozas Ambrazevicius, the leader of the Nazi collaborationist government. In a funeral organized by the central government, Ambrazevicius was reburied in 2012 with full national honors in the city of Kaunas. Four years earlier, Lithuanian prosecutors investigated for alleged war crimes four Jews who fought against the Nazis with the Russians. The investigation was dropped amid an international outcry. Lithuania is the only country whose government officially branded Soviet occupation as a form of genocide. That “Soviet-sponsored genocide” is commemorated in Lithuania far more prominently than the Holocaust. And even any mention of the Jewish genocide had been absent from Vilnius’ state Museum of Genocide Victims until 2011. “Exposing that some Lithuanians who are considered patriotic heroes are really war criminals would undermine the good-versus-evil narrative,” Katz noted. It is precisely Vanagaite’s credentials as a good Lithuanian from a good Lithuanian family that has made her message so piercing to fellow Lithuanians, said Zuroff, the co-author of “Our People” and longtime critic of Lithuanian governments. But Vanagaite and Zuroff are not in full accord. She believes that in lieu of Lithuanian introspection, the extent and cruelty of Lithuanian complicity has been vastly exaggerated – including in survivors’ testimonies. She cast doubt on testimonies about a man who was boiled alive in Panevezys and an account that locals, after slaughtering dozens of Jews in Kaunas, sang the Lithuanian anthem. Zuroff says he has no reason to doubt these accounts. “But these details are less significant in light of the movement that this book started,” he said. Meanwhile, Vanagaite is experiencing the public denunciation that for years has been directed at Zuroff, Katz and other critics of Lithuania’s refusal to prosecute Holocaust perpetrators. Cast as a Kremlin agent in some publications and as a closeted Jew in others, Vanagaite says some of her friends no longer wish to speak to her. Author Rūta Vanagaitė recently presented a book, “Our Own”, about the Holocaust in Lithuania. Although historians have been researching the topic for years, the Lithuanian society has yet to realize and acknowledge the part their compatriots, ordinary Lithuanians, played in the mass killings of Jews, Vanagaitė says. It is a book dedicated to the 75th anniversary of the great Jewish massacre in 1941 when almost the entire Jewish community in Lithuania was killed. In total, about 200,000 Jews were killed in Lithuania between 1941-1944. There were 227 mass killings of Jews all over Lithuania. “I took this theme because I was struck by how feared it is in Lithuania. I wanted to understand what really happened in our country and to our people, and why it happened. This is not a historical book – this is a book for self-development. I know that Lithuania did not wait for this book. That is why I wrote it. It was the most important moment, when somebody had to write this book. Those witnesses are 85-90 years old, they will no longer be with us in a few years,” said Vanagaitė. While writing the book, she researched archives and travelled to killing sites across Lithuania, together with the ‘Nazi hunter’ Efraim Zuroff, to talk to living witnesses. “They are now 85 or 90 years old. Over the last 75 years, no one came to ask them about [the Holocaust], so now they are afraid to talk,” Vanagaitė tells in an interview to the LRT TV programme Dėmesio Centre. How would this explain the enthusiasm with which Lithuanians took part in massacring Jews during World War Two? There wasn’t much enthusiasm, except for a few [who] were motivated by it. The rest were simply doing their work. But it seems that your book is precisely about how willingly Lithuanians were killing Jews? Those who took part in the killings for spoils were probably willing. Ordinary Lithuanians joined battalions because they were told that those battalions were the seeds of the army of independent Lithuania, that they would be going to fight against the soviets and defend Lithuania. At first, these battalions would be sent to guard buildings, later Jews, and after that they took the Jews to pits and lined them up. It took enormous willpower to say “I will not shoot.” But there were some who did not shoot Jews. Would they get away with it? Yes. Officers [overseeing the killings] were usually Lithuanians, Germans would not even go to massacre sites in the provinces. If a Lithuanian officer saw that your hands were shaking, how could he be sure you would not turn and shoot at him? If he saw you were nervous, on the edge, you would not even get a weapon. But there were some who wanted to shoot. Those with enthusiasm were the marginals. Meanwhile those who were joining the battalions were motivated by a sense of duty or something else. Some wanted money, others had no home, yet others loved their country and hated the Soviets. There were those who killed 20,000 people with their own hands over four years. While researching for the book, you must have read everything written on the topic in Lithuanian? I have. But my main sources were files [in archives] and conversations with people. An ordinary person would not go to archives and spend six months going through files. Or read all the books. So my goal was to put all information into 300 pages so people could grasp what really happened. Why did you take up this subject? I have done several other projects [on the Holocaust] before, I find the topic interesting, although I do not have any Jewish ancestry myself. There are few Jews left in Lithuania, only several thousand, but we continue to hate them. Moreover, there is great fear and reluctance to discuss the subject. People working in public institutions are particularly fearful. You give a new angle on the subject. What was your goal? I tried to take a closer look at people who killed, to understand them, to see how they started, what motivated them. We still don’t know what was happening by the pits. All we know is that thousands of Jews were killed and that it was the marginals who did it. But what do we know about the fact that they wouldn’t shoot children, but pound them against trees to save bullets? That there have been found a lot of children’s bodies with intact skulls? This means they were buried alive. Do we know about the incredible anti-Semitism that the Lithuanian government of the time fostered? It emboldened people, they would be told that Jews were lice, mites, communists and what have you. We can still hear people saying that Jews were communists. These are words of Hitler and Goebbels. You visited the killing sites. Are there still many witnesses left? Yes. There are people living near each killing site who remember well. They are now 85 or 90 years old. Over the last 75 years, no one came to ask them about it, so now they are afraid to talk. No one, except Romas from Šeduva, agreed to tell me their name or take a picture. They said they were afraid, that someone might come and kill them. Who will come, who will kill, I asked. Lithuanians, they said. “Nazi hunter” Efraim Zuroff, director of the Simon Wiesenthal Center who attended the presentation of your book, said that the Lithuanian government was reluctant to do much about the Holocaust. What did he mean? When the United States deported war criminals – Kazys Gimžauskas, Aleksandras Lileikis, Algimantas Dailidė – the process was stalled and not one criminal was sentenced. I am surprised by one more thing. I went to the government to enquire about a list of 2,055 names prepared by the Genocide and Resistance Research Centre; this list is gathering dust at the government’s chancellery since 2012. I asked if it were possible to take that list out, to give it to prosecutors. The Genocide and Resistance Research Centre worked three years compiling the list of 2,055 names and there are tens of thousands files left; the centre does not know what to do next. This is what I was told by the deputy chancellor: whatever we do, the Jews will never have enough. In your book, you dethrone certain individuals and events in Lithuania’s anti-Soviet resistance. Like the June 1941 uprising, Lithuania’s provisional government, the white-bands (anti-Soviet volunteer squads). The June uprising was started by a man named Norkus who hoisted a Lithuanian tricolour on the Resurrection Church in Kaunas. Later, he was one of the commanders of the Nation’s Defence battalion and, in early July, 3,000 innocent people were killed under his command. The white-bands were very expertly used by the Nazis. The Lithuanian government of the time set up the first concentration camp at the 7th Fort in Kaunas, where these Jews were murdered. The killings were directed by a man who, just days before, had raised a Lithuanian flag at a church. What is he? A hero? You also write that even priests were rather lenient about such “sins”. For instance, a Catholic church in Minsk offered absolutions to Lithuanians who killed Jews in Belarus. Each battalion had a chaplain who would hold service every Sunday. At times, the guys would go to the confessional five at a time. To make it faster, the sins were identical after all. Afterwards they’d sing the Lithuanian anthem. What is it that you want people to take away from your book? The take-away is very simple. All this happened at the intersection of very many unfortunate circumstances. Thousands of young Lithuanians were pushed into this. I cannot blame them, nor can I justify them. If, under particular circumstances, it happened once, can we be sure it won’t happen again? How can we condemn the boys of Islamic State, if our own boys of 15-16 years used to go shooting people after school? This has happened and it can happen again. We cannot close our eyes to truth, however painful and ugly it is.